"Waves crash, baby don't look back..."
Pete just came off a seventeen-day long vacation, which is partially the reason I have been on a blog-cation. 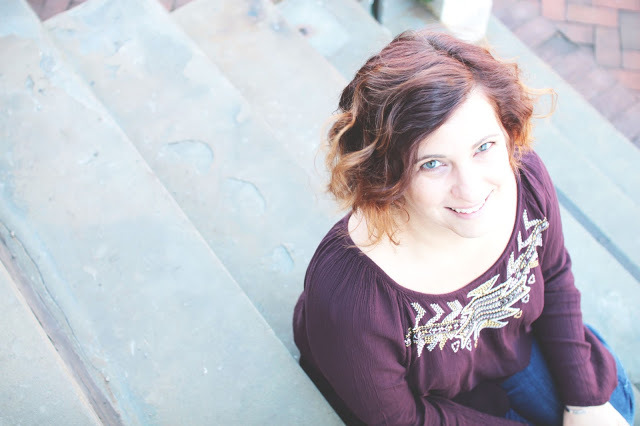 Having Pete home for so long was such a treat that blogging just wasn't a priority! He's gone back to work and we are back in our "normal routine" around here, which is both good and bad. Good because it's easier on PJ when we're following our usual timetables, and bad because we got back to Pete sleeping during the day and working at night. Bah. Eager to do things with PJ during Pete's time off we headed to Margate for some time down the shore! (For those of you not from NJ, the phrase "down the shore" is the proper way to express going "to the beach".) Margate is a really nice area, between Ocean City and Atlantic City, filled with fun bars, surf shops, and home to Lucy the Elephant! Daddy buried him in the sand! He loved it! On our first full day we were joined by some of our favorite friends and their very excited littles! Within a half hour of their arrival at the house we were headed to the beach! PJ clearly remembered the ocean from his first visit because as soon as he had the water in his sights he took off to dip his toes in! His buddy Ezra...not so much. 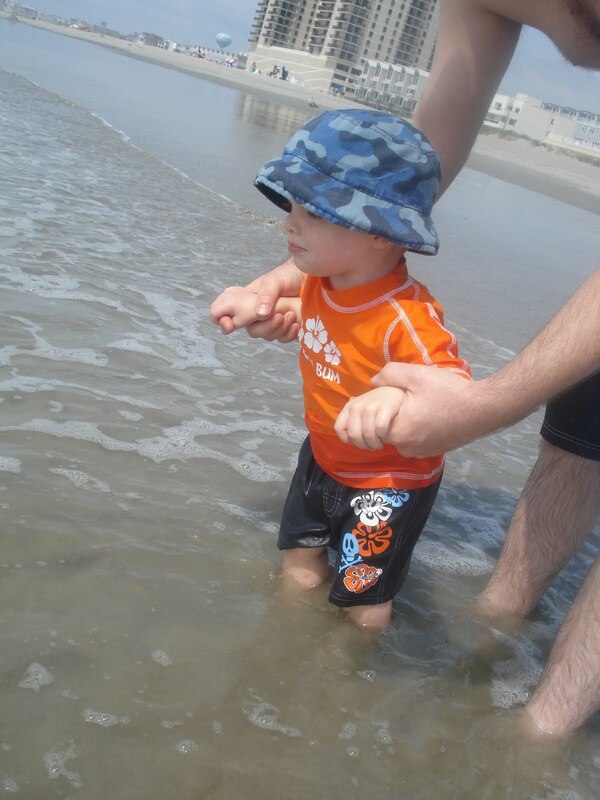 That handsome little dude, upon feeling the waves on his feet, promptly ran back to his stroller and climbed in! (Hi. Lar. I. Ous!) Despite the differences in opinion about the ocean, all of the kids had a great time splashing, digging, catching (sand crabs! ), screeching and laughing! 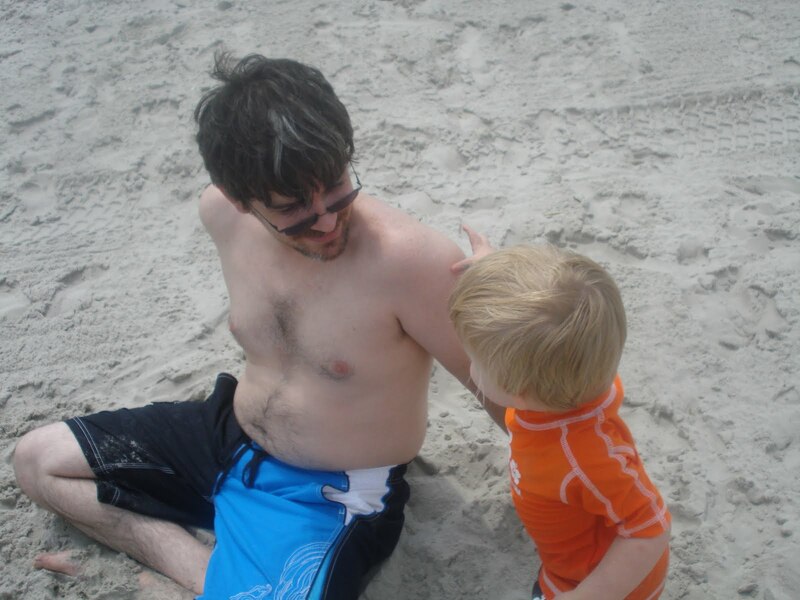 It was a perfect beach day...for someone with a translucent child like I have! The sky was overcast and the air was warm, so there was no searing sun to directly penetrate the NINETY GAZILLION layers of sunscreen I put on PJ. I forgot to put sunscreen on myself and burned. Fail. We packed up and headed back to the shore house for some lunch and after everyone ate, the most amazing thing happened. Every. Single. Kid. Took. A. Nap. It was kind of the most awesome thing that's ever happened. The kids snoozed and the grown ups had a relaxing afternoon together, chatting and enjoying the quiet! After a pizza party for dinner, our friends headed home. Pete, PJ and I walked around the corner to Rita's Water Ice for some dessert. 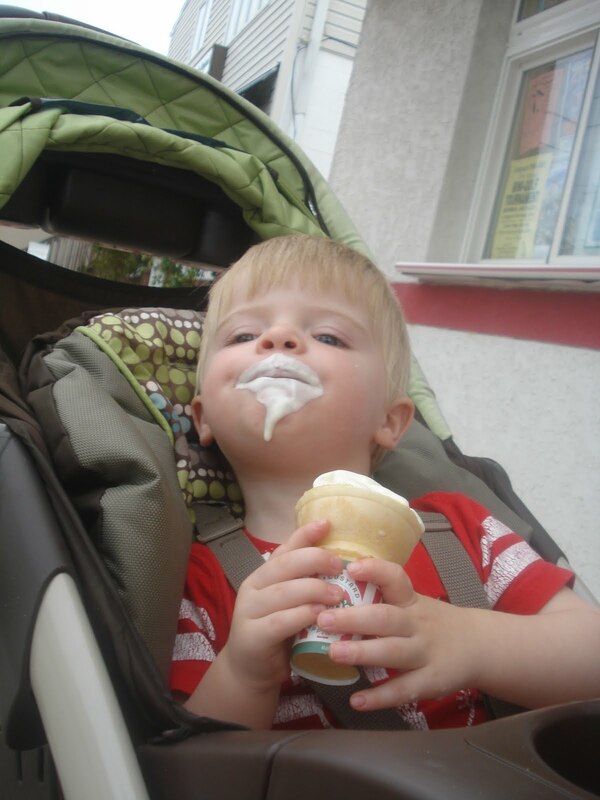 PJ got his very own ice cream cone and messily devoured the entire thing! We headed back home and after we bathed our sandy, ice-cream-y son, we tucked him into bed after his first full day at Margate! PJ slept like a rock that night (yay!) and the next morning it was back to the beach for more fun! After his nap, we headed to the boardwalk in Ocean City! PJ's not really at an age yet where we can just grab a few slices of pizza and grab a bench to sit and eat, so we found a sit-down place to have dinner. It was delicious and once our bellies were full, we headed to Wonderland Pier so PJ could enjoy his first boardwalk ride! 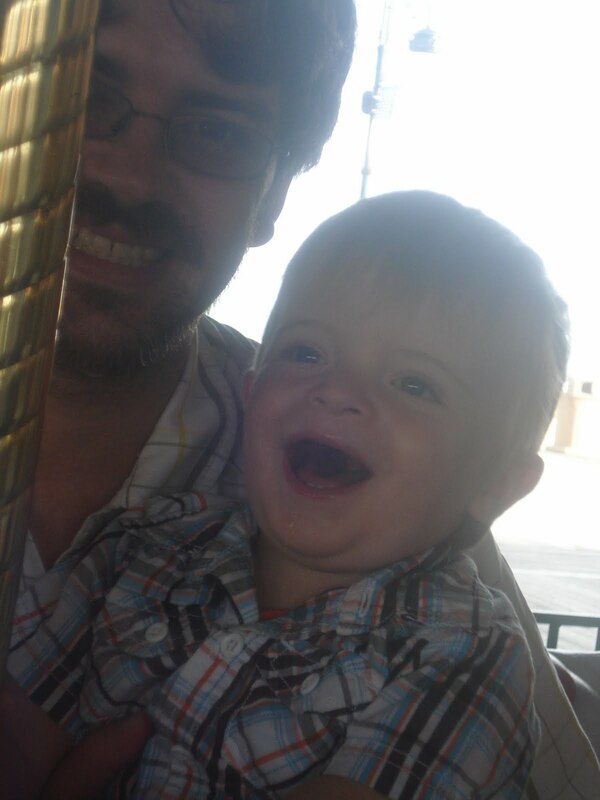 There are not a lot of rides that are safe/appropriate for a 19-month-old, so we settled on the merry-go-round. We saddled PJ up on a magical carousel horse and began our ride. The music played and the horses whirled and PJ loved it! He bounced and laughed and screeched with joy and his expression was priceless! The look on his face will be in my heart forever! It was so exciting to see PJ embark on a tradition that was also a part of my and Pete's childhood- the magic and excitement of the boardwalk! On the morning of our fourth day, PJ was starting to show signs of wear and tear! He was tired and a little cranky and had an "I miss my bed" vibe. It was time to go home. So off we went. It was a wonderful mini-vacation and such fun to see PJ really enjoy the shore and the Margate home his family shares. We are so, so lucky to have such an asset to our family, a place for all of us to enjoy and make/share memories! 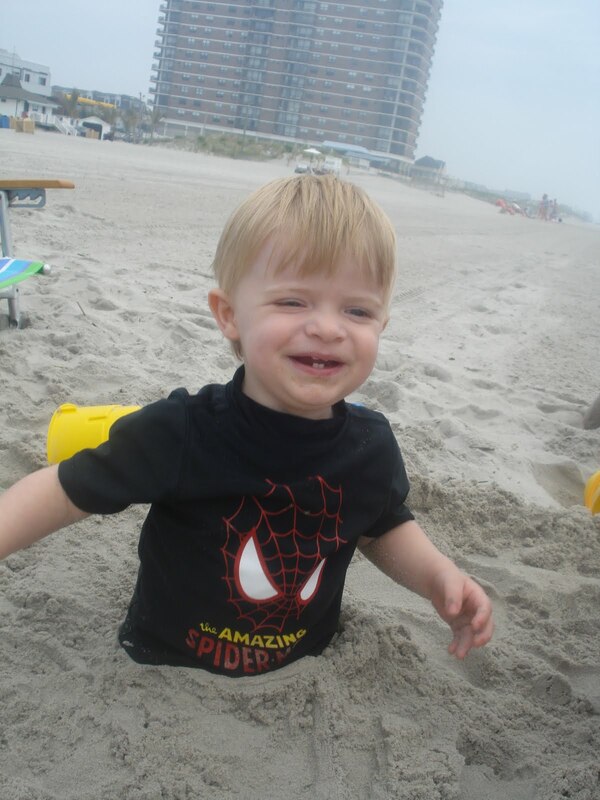 Seeing PJ splash in the ocean and dig in the sand and sleep soundly at night meant to much to Pete and I. We don't want PJ to be spoiled, but we do want him to have as much magic as possible, even if just for a little while! I love his suit and his sweet little face! Treasure him while you can! 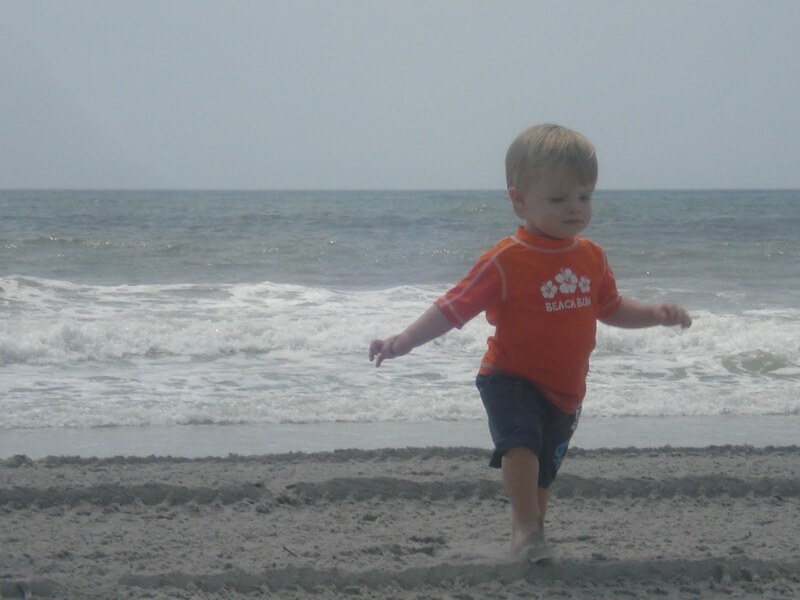 In a few years, him catching crabs down on the shore will not be so cute!